Liquidlast's both strongest and weakest aspect is it's staying power. As it says on the tin it does LAST. Once you have applied it, it won't be coming off without a good scrubbing with a make up wipe/some eye make up remover. So on one hand, during the day your eyeliner is not going to budge, but on the other hand it is not fun to scrub your eye like a madwoman to get your eyeliner off (especially if your eyes are sensitive). Also, if you make a mistake while applying Liquidlast, dipping a cotton bud in some make up remover and trying to correct it is not going to work. A good scrubbing is the only thing that will remover the eyeliner, and takes off your foundation/eye primer around the eye area with it. 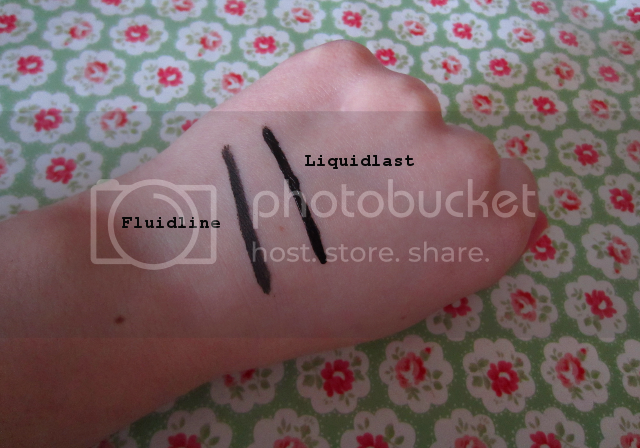 So I would not recommend Liquidlast for a liquid eyeliner novice. Another positive is the sheer 'blackness' and opacity of Liquidlast. 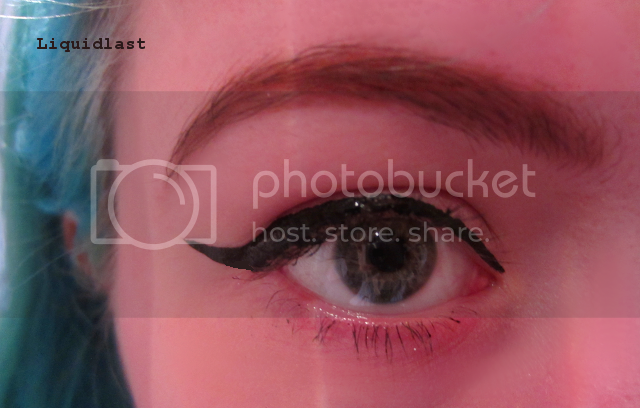 It's nice and black without being too shiny or too matte, it's perfect for the typical winged/cat eye look. When I was working in retail I actually once had a customer compliment me on how the liner looked and ask where it was from. 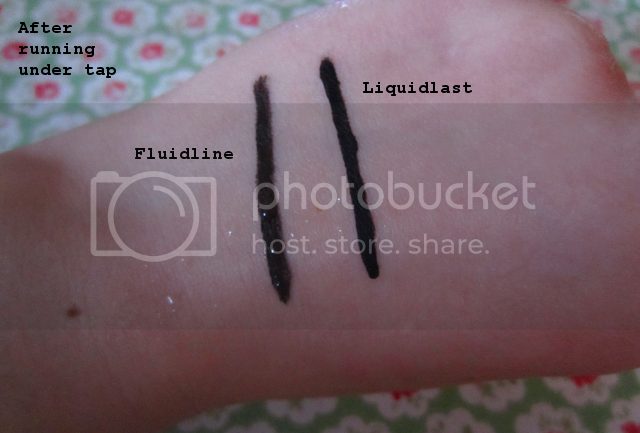 First thing about Fluidline is I'm pretty sure you get more product for the same price as Liquidlast, and as you can control more easily how much product you put on the brush it will last longer too. It glides on smoothly and any mistakes you make can easily be corrected with a cotton bud (sans remover, you won't need it). 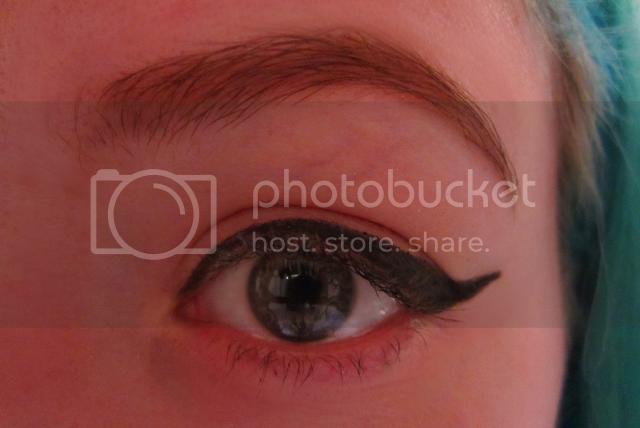 I also find I can make way more shapes/control my lines better with Fluidline (although I find it more difficult to make my wing tips as pointy as with Liquidlast) and because the product isn't liquid or difficult to remove like Liquidlast I can use it on my waterline and around the tear duct. 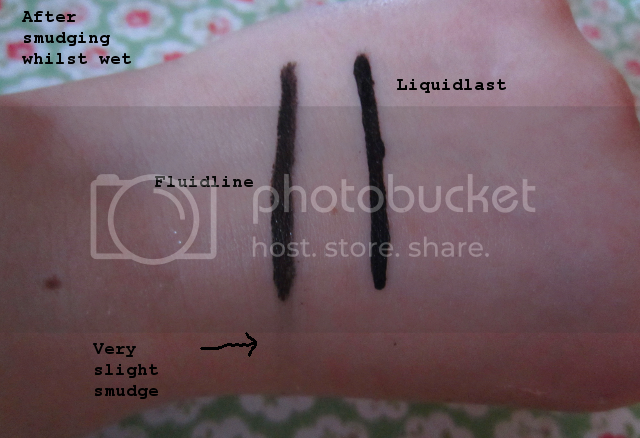 However, Fluidline does not have the same opacity and 'blackness' that Liquidlast does, it's much better for subtle looks were perhaps you want your eye shadow to stand out more than your liner or you just want your eyes defined a little. Also technically this product is more pricey because you need to buy a brush to use with it. 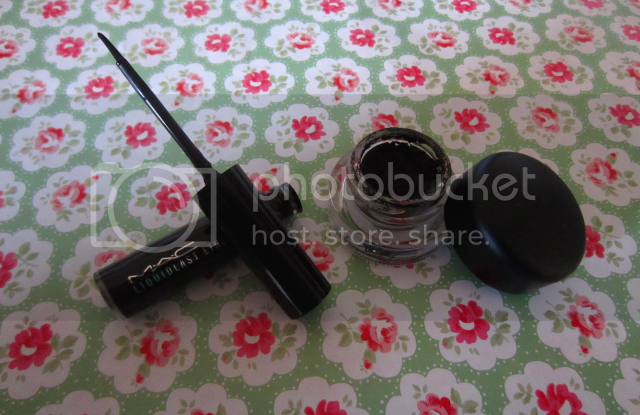 I was offered the MAC eyeliner brush when I bought Fluidline and it costs 16 POUNDS. Ridiculous, my Sigma foundation brush cost less than that. I bought the Real Techniques eyeliner brush which does the job perfectly. Great review. It was very thorough. 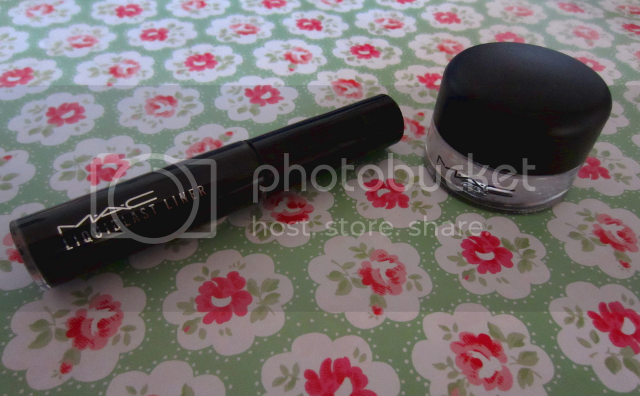 I have tried the MAC Gel Liner which was okay but I prefer the Clinique gel one. I used to be liquid liner loving kinda girl but have switched to gel, it's a lot easier to apply and last way longer, IMO!